This blog offers a map of the current and rejected Dakota Access pipeline routes, and an article with a map of pipeline spills. It updates actions by Christian religious leaders who went to North Dakota to support the Standing Rock Nation in its opposition to the Dakota Access Pipeline. Read on. Exactly how denominations live out these resolutions in a practical way remains to be seen. This is really only the start of a difficult conversation. The video also gives a sense of the militarized response to the Water Protectors opposing the pipeline. This map was provided by the Healing Place Collaborative. 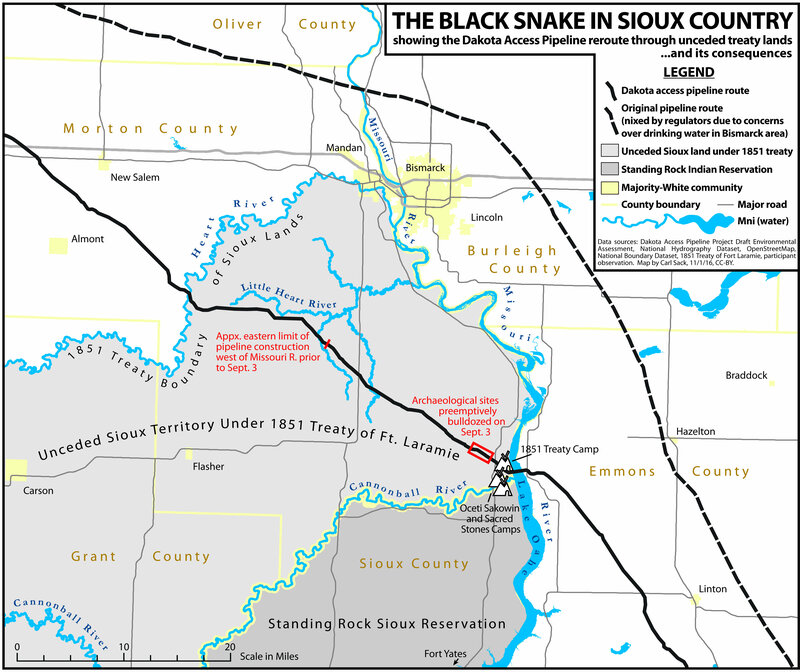 Thanks to LeMoine LaPointe for sending this 2015 article from the Center for Effective Government that gives the details on pipeline spills, and validates the concerns of the Standing Rock Nation. Click on the link for the full article and a map of spills. This is a story about art, politics, and unintended consequences. This story is instructive because it is a reminder that we all have choices about whom we do business with. How we spend our time and money represents a statement about our values. Singer/songwriter Jackson Browne and the Indigo Girls have played concerts at the Cherokee Creek Music Festival. The festival, it turns out, is owned by Kelcy Warren who also is a billionaire backer of the Dakota Access Pipeline. Warren also owns a music label and produced a tribute album of Browne’s songs, including one performed by the Indigo Girls. Browne is a long-time Native American rights advocate, and neither he nor the Indigo Girls knew about Warren’s connections to the pipeline. They have felt compelled to make public statements. When this connection was brought to our attention, Amy and I wrote a letter to Mr. Warren, voicing our protest over his company’s pipeline (DAPL), and several other artists who had performed at his festival signed the letter in solidarity. We are simply saying that building this pipeline is the wrong thing to do, and its disregard for Native land, water, and rights is in direct conflict with our philosophy as artists and people who care about Indigenous peoples and the environment. Organizations have been researching DAPL’s various financial connections so that people can make choices about where they do business or express their concerns to business leaders. For instance, here is an article from Yes! Magazine about the banks involved in financing the DAPL project and how to contact them. On this day in history, Nov. 4, 1791, the U.S. Army suffered its greatest defeat to Native American forces in the Battle of the Wabasha. The battle was fought by the Western Confederacy of American Indians near present day Fort Recovery, Ohio and the headwaters of the Wabash River, according to Wikipedia. The Confederacy included many tribes in the Great Lakes Region that came together to resist U.S. expansion into the area. Of the 920 U.S. soldiers, 632 were killed and 264 were wounded. Approximately one quarter of the entire U.S. Army was wiped out. This was three times the death toll that would later take place at Little Big Horn. The military disaster resulted in the first ever Congressional investigation.